For many people, especially Americans of a certain age, Vietnam conjures up images of jungles and guerrilla warfare and a fight against the spread of communism with the communist agenda run out of the north of Vietnam in Hanoi. Today, Vietnam is a vibrant, united, albeit, still communist country that now has a capitalist streak. There are amazing things to see and plenty of awesome food to keep your belly from rumbling. We looked forward to starting out explorations in northern Vietnam; cooling off in Hanoi which is known for a slightly more temperate climate after a scorching April week in Cambodia. Looking for adventure in Vietnam? You'll find it even in simple things like trying to cross the street in Hanoi! Here are our impressions of Hanoi and some highlights of our introductory city break in the Vietnamese capital. We landed in Hanoi late on a Saturday evening on a direct flight on VietJet from Siem Reap, Cambodia. Traffic in Vietnam is legendary and getting run over by a motorcycle is a very real possibility. We arrived just in time to enjoy a car-free day exploring the area around Hoàn Kiếm Lake in Hanoi's Old Quarter. The roads around the lake are closed to cars and locals come out to spend a day sans stress and pollution while enjoying the lake. We had fun watching dads follow their kids around in remote-controlled vehicles. The kids seemed so happy to be "driving" and seemed to have no idea they weren't actually controlling the cars. These kiddie car stations were set up on the roads all around the lake. In the evening, locals began line-dancing in large groups. It was pure joy and so delightful to watch the residents of Hanoi just let it all go and have a fun night out! We did a lap around the lake (it takes less than an hour) and admired the centuries old pagoda (Tháp Rùa, aka "Tortoise Tower") on an island in the middle of the lake. 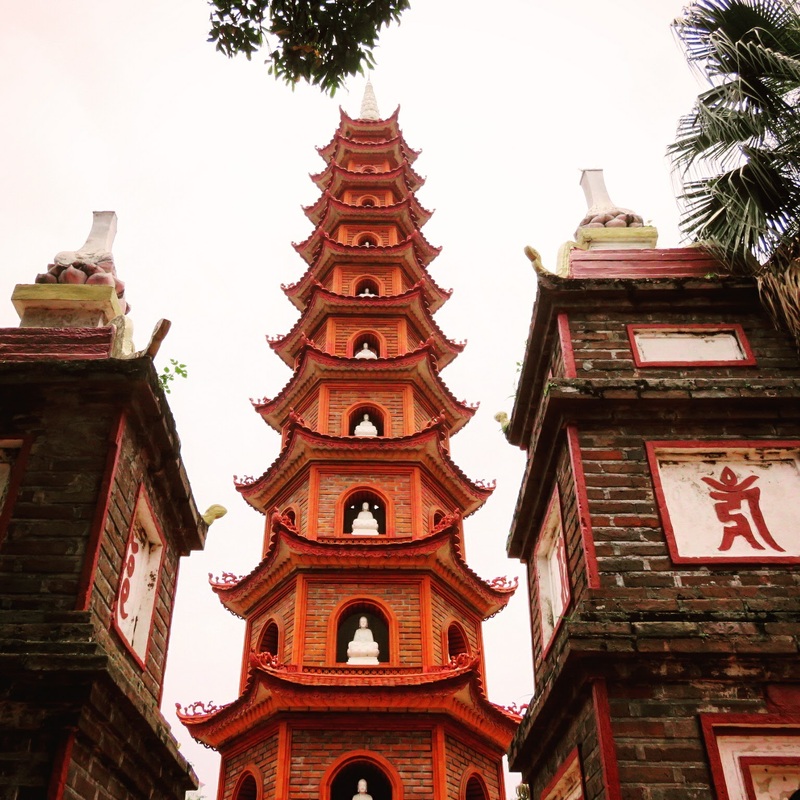 An iconic red bridge leads to Đền Ngọc Sơn, a temple in the center of the lake. What an idyllic way to start our adventure in a city with a reputation for being frenetic. Vietnamese water puppetry is a unique art form especially prevalent in northern Vietnam. We took the opportunity to book tickets to Thang Long Water Puppet Theatre in Hanoi. Puppeteers made the tiny intricate creations dance over the water. The hour long show which runs several times daily also features plenty of smoke and fire too. It's worth catching a short and sweet water puppet performance in Hanoi. Across town, we rocked up to the Temple of Literature. The walled complex is insulated from the noisy streets of Hanoi and is a great respite after a day of exploration. 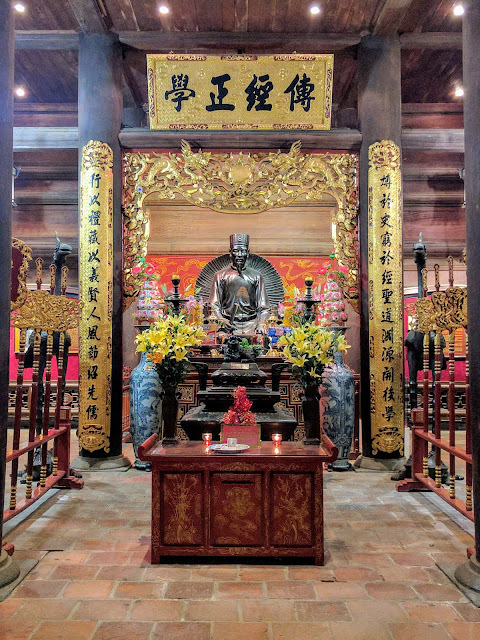 The Temple of Literature in Hanoi is a 1000 year old Confucian Temple with a shrine to Confucius himself. The complex also featured some pretty amazing bonzai trees with little dioramas sitting under the trees. For Americans and French visitors to Hanoi, Hỏa Lò Prison is a must-see to understand more of the history of Vietnam. Hỏa Lò Prison was originally run by the French when Vietnam was under colonial rule. It's very clear from the captions on the exhibits what the Vietnamese think of the French. The prison changed hands after the French were evicted from Vietnam. During the Vietnam War (or the "War of American Aggression" as it is known here), Hỏa Lò Prison was used to house American prisoners of war including future U.S. senator John McCain. In contrast to the exhibits on the French colonial period, the Hanoi Hilton (as it was known by American POWs) showcased photos of happy American prisoners and emphasized that they were well-fed and well-treated. 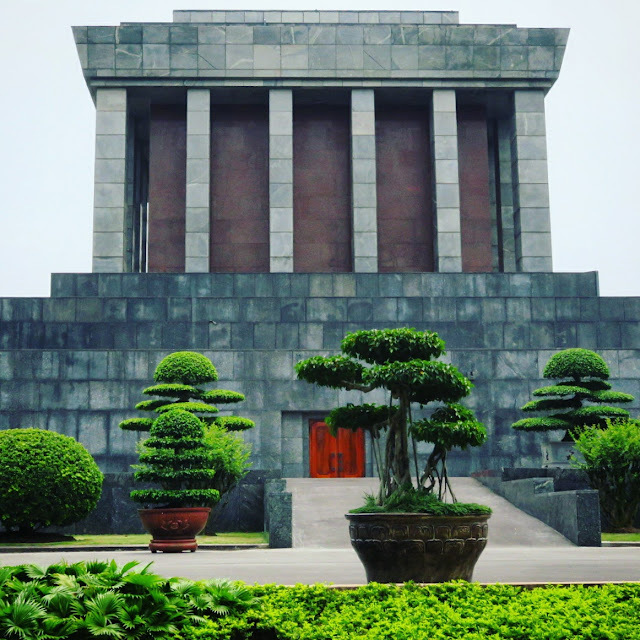 Another fascinating stop in Hanoi is the Ho Chi Minh Museum. Ho Chi Minh is viewed as the liberator of Vietnam from French colonial oppressors in the 1950s. In our travels around Vietnam, he seems to be universally revered. Ho Chi Minh also led the communist forces of the North in the civil war in the 1960s. The communist forces in the north in the end emerged victorious (after Ho Chi Minh's death) and the country was reunited under a communist government. Today, the Ho Chi Minh museum showcases the life and accomplishments of the former Vietnamese leader. School children in matching, brightly colored t-shirts line up to learn more about their country's history. Adjacent to the Ho Chi Minh Museum, Ho Chi Minh's Mausoleum welcomes thousands of Vietnamese people every day hoping to get a glimpse and pay their respects to Vietnam's liberator. After learning so much about the war torn-era of Vietnam's history, we made one final stop focused on peace. Hanoi's Trấn Quốc Pagoda is a Buddhist temple located on Tây Hồ (aka West Lake). Tiny buddhas stared down at us from the tall, thin pagoda and the smell of incense wafted through the air as we reflected on our brief visit to Hanoi. 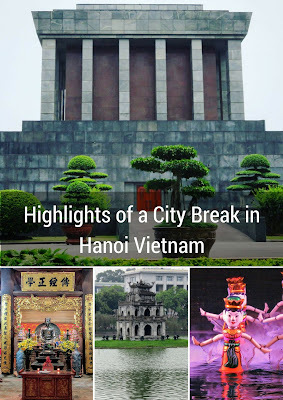 As you can see, we managed to squeeze in lots of fun things to do in Hanoi in about 2 days. We also squeezed in an overnight visit to Halong Bay from our home base in Hanoi (more on that later). As you can see, Hanoi has all the makings for a short and sweet weekend city break in Vietnam. 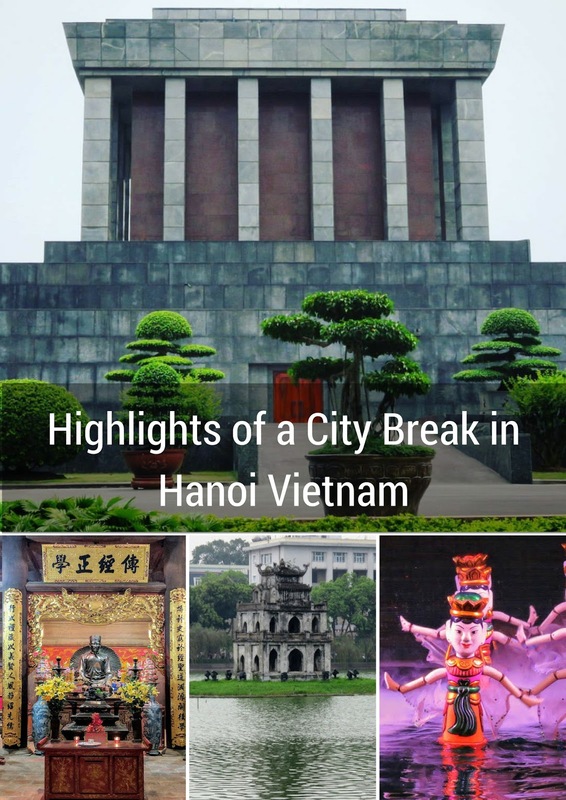 Find out about things to do on a city break in Hanoi, Vietnam. A photo-rich post by travel blogger, Jennifer (aka Dr. J), from Sidewalk Safari.